Imaginarium 2015 at Crown Plaza Hotel in Louisville, KY called a wrap on its second year this past weekend, and in a nutshell, the event is going in the right direction. It strives to be a full experience reader-writer weekend seminar and offer guests an array of lessons and memories (not to mention reading material), and in that goal, the organizers pushed forward in several ways. More attendance (check). More book sales (check). More panels on more topics with higher participation (check-check-check). More publisher and author interactions (check-check). I personally had a panel Friday night that kept me from attending two other events that looked very cool, but that’s what ya’ call a good problem. What didn’t change was the interactions between authors and the conversations and opportunities to network. People I had met briefly the first year I got to know better in year two. The seeds of future collaborations and business followups were planted and will continue throughout the year. And I met some new readers. What more can one ask for? I met author peeps John F. Allen and Chris Garrison for breakfast, carpooled with John Friday morning, and we met back up a bit after noon which gave us plenty of time to eat and set up before the vendor room opened at 4. (The hotel burger rocks–I had it again on Saturday). I sold a copy of Haunting Blue to a new reader (more on this later). My evening panel on comic books and the silver screen had a small but enthusiastic group, and we discussed the topic from many angles in that hour. 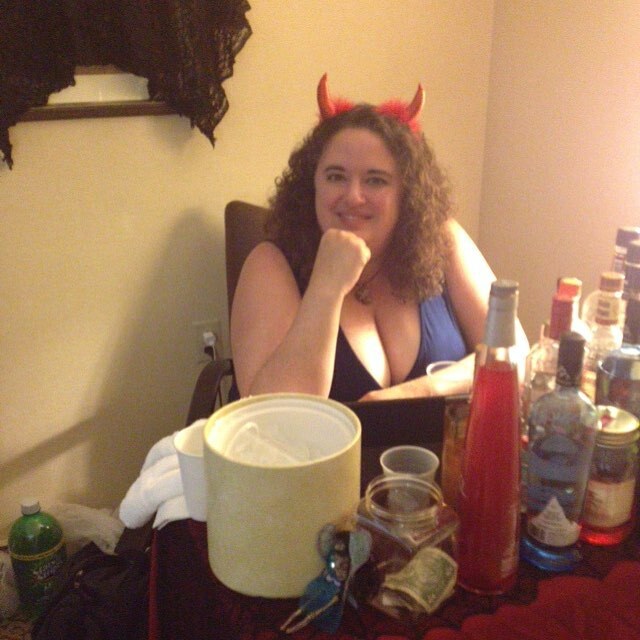 Your devil bartender Elizabeth Donald will serve you now. Then there was hard rock bands in the ballroom Friday night and an active room party hosted by Elizabeth Donald where many of the writers hobnobbed. Don’t Panic! 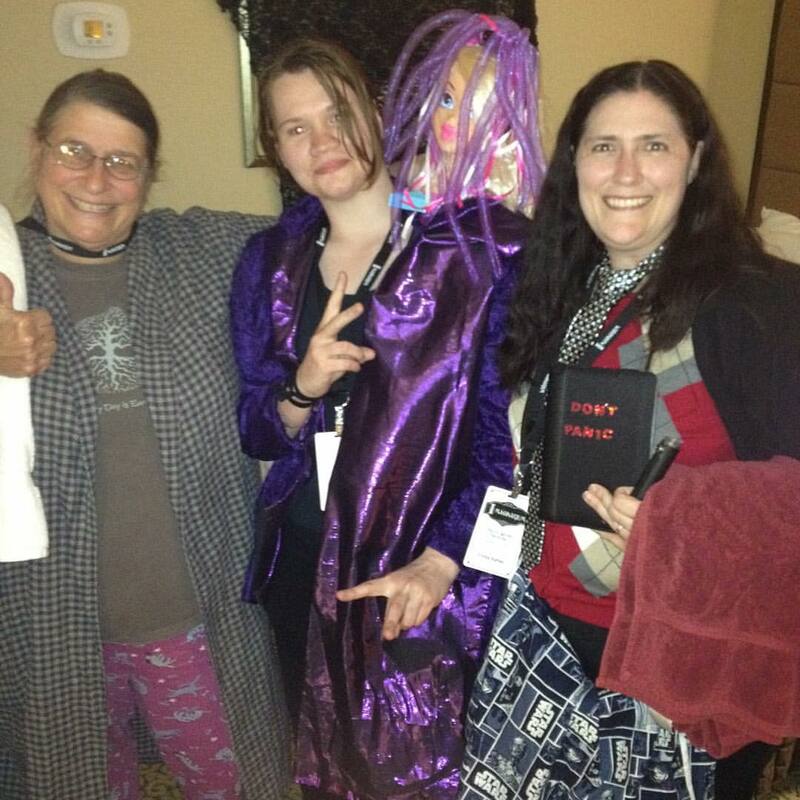 Arthur Dent and co. at the masquerade. My 9 pm panel on writing as series, although scheduled during the awards banquet, was very well attended by another enthusiastic crowd. I was slotted to moderate, not the easiest thing two days into a convention but it all turned out just fine. The masquerade started at 10:30 pm and I spent the evening going back and forth between that and the room party, night two. Some great costumes were out on display. 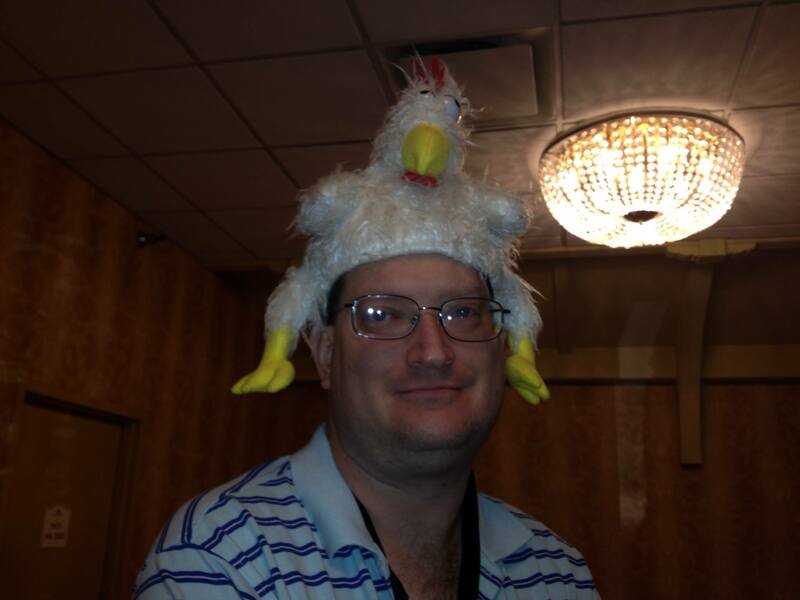 The workshop taught by Michael Knost was slotted for 1:30 in which he discussed the various ways and reasons that a writer can and should stay “invisible” to the reader, including, yes, using a chicken hat to demonstrate deep third point of view. Oh, and about the woman who bought Haunting Blue Friday night? She returned to my booth Sunday morning to say how much she enjoyed it and purchased Haunting Obsession. What author doesn’t love that? Overall, Imaginarium is growing in all the right ways and is the place where we should all plan to be next year. Everyone involved in the planning and execution can take a big bow (and a couple day nap) for their accomplishments. Already looking forward to next year! Click here to see my complete photo album of the weekend. This entry was posted in Uncategorized and tagged author promotion, book conventions, Book Promotion, book series, book signing, books, Chris Garrison, convention, ghost stories, Haunting Blue, Haunting Obsession, Horror, Imaginarium, Indiana authors, John F. Allen, Kentcky, paranormal thriller, reading, RJ Sullivan, romance, science fiction, series, seventh star press, SF, sifi, space opera, workshop, writing, writing panels. Bookmark the permalink. I’d agree with everything you said though I personally had fewer sales this year… perhaps this isn’t the right convention for me. I don’t know. We’ll have to think about it. My experience was much like yours, RJ. (And thanks for the compliments on my moderating — and books!) Bigger attendance at panels, more people perusing the expo hall, and definitely more sales. And maybe it’s just me, but a less anxious, more fun vibe overall from everyone than last year. Looking forward to Year 3!